In the world of power tools, stationary tools are known as the most accurate, most heavy-duty tools around. While portable tools may be handy, some jobs require the performance, speed, and accuracy of a stationary tool. How do you know which stationary power tools to buy? It is best to make a list of your projects and maintenance needs, and then buy versatile tools that will suit the majority of your needs. Popular stationary power tools include table saws, radial arm saws, miter saws, band saws, drill presses, jointers, benchtop planers, sanders, and lathes. Table saws: Often considered the workshop's most important tool, table saws are able to rip, crosscut, miter-cut, bevel-cut, dado, rabbet, taper, and trim with unparalleled speed and accuracy. They come in three styles: benchtop saws, contractor's saws, and cabinet saws. The benchtop saw is the smallest and least expensive of the group, while a cabinet saw is smaller, but offers more accuracy and power, as well as less vibration, than a contractor's saw. For table saw reviews, visit these Consumer Search and Fine Woodworking table saws pages. 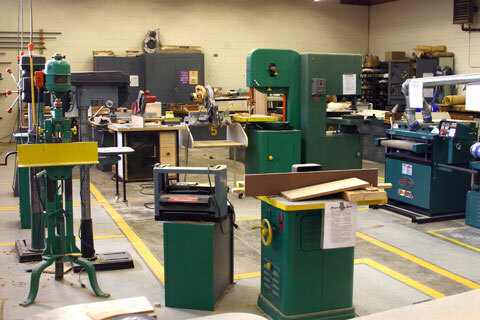 For table saw safety information and manufacturer links, please visit TableSaws.us. Radial arm saws: A radial arm saw is similar to a portable circular saw, but it is attached to an overhead trolley. A radial arm saw is used to accurately crosscut and trim to length, rip wood to width, cut dadoes, rabbets, and grooves, and cut angles and bevels. A radial arm saw can be outfitted with accessories to complete tasks such as sanding. For more detailed radial arm saw information and reviews, visit this Wikipedia radial arm saws page. Miter saws: Miter saws are similar to radial arm saws, but they are safer and easier to work with, as well as more accurate. A miter saw is designed to square board ends, cut angles, miters, and compound miters, and crosscut small and medium-size stock. There are basically three kinds of miter saws. A standard miter saw makes crosscuts and miter cuts, while a compound miter saw can cut bevels. Finally, a sliding compound miter saw cuts wider stock than other saws. For miter saw information and reviews, visit these Wikipedia and Fine Woodworking miter saws pages. Band saws: Band saws do the same job as a hand-held jigsaw, but its blade has been welded into a continuous loop. Band saws are best used for cutting curves and circles, making angled and beveled cuts, cutting thick pieces of material into thinner pieces, and making templates. Two sets of guides, above and below the table, keep the band saw blade in place. A band saw's depth of cut is the distance from the table to the upper blade guides; its throat is the distance from the blade to the rigid, vertical frame at the back of the saw. Stationary band saws are large, starting at 12 inch throat sizes and ranging up to 36 inch throat sizes. A 14-inch band saw should meet most home workshop requirements. For band saw information and reviews, visit these Wikipedia and Fine Woodworking band saws pages. Drill presses: A drill press is a necessary stationary tool for anyone who makes cabinetry or other fine furniture and needs evenly spaced holes. 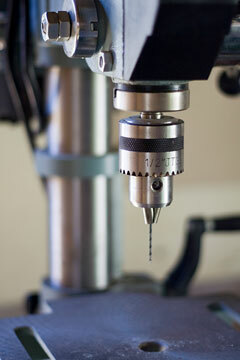 Unlike a hand-held portable drill, a drill press can drill holes at precise angles, and can also drill hard metals. A well-accessorized drill press can double as a drum sander, planer, router, and mortiser. For drill press reviews, visit these Popular Mechanics and Fine Woodworking drill presses pages. Jointers: Jointers plane board edges smooth and straight, but they can also be used to take out saw marks, remove slight warps and twists from boards, taper, bevel, or chamfer stock, or cut rabbets. For jointer information and reviews, visit these Wikipedia and Fine Woodworking jointers pages. Benchtop planers: A benchtop planer is the perfect tool for any carpenter who needs to plane boards to an exact thickness or surface the faces of rough stock. Planers are sized by the width of their cutterheads, not by the maximum thickness they can handle. For stationary planer information and reviews, visit these Wikipedia and Fine Woodworking planers pages. Lathes: If you are a carpenter doing projects in which wood turning is involved, you will need a lathe. A lathe can turn table legs, spindles, candlesticks, and other decorative objects, and can also be used to make bowls, platters, and other vessels. Lathes come with a variety of different power ratings and speed ranges, depending upon your needs. For stationary lathe information and reviews, visit these Wikipedia and Fine Woodworking lathes pages. Sanders: Stationary belt and disk sanders are perfect for final finishing jobs, as well as for sanding edges and surfaces, rounding corners, and smoothing curves. While you can buy separate disk and belt sanders, one of today's popular choices is a combination sander.